It's been a while but I'm still alive and kicking. 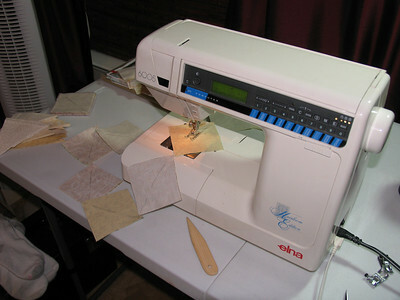 I was telling my sister Brenda that I could either update the blog or quilt. Hmmm... tough choice. NOT! Sorry guys but if I'm on a roll I can't just put on the breaks to update, thus the long time between posts. But I have tons to tell you all! First an update on Alba's quilt. 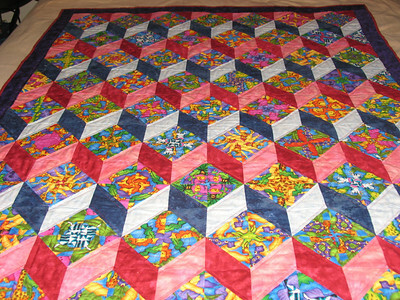 The quilt previously known as Alba's quilt will now be known as Pinwheels and Posies. 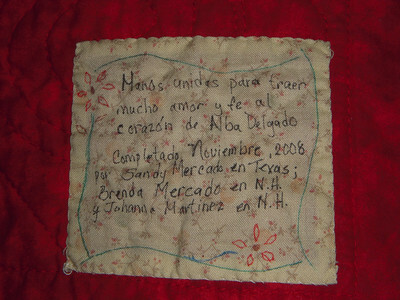 That is because Brenda found one of my unfinished quilts among her stash and enlisted JoAnna to finish the quilting. This lead to Alba recieving a quilt much sooner than the one I had started for her. I made the top when I worked with Bethany Reynolds on her second Stack n Whack book (I was one of her testers) but never got around to quilt it. JoAnna took care of that with great talent and efficiency. Brenda then wrapped things up by binding the quilt during her trip over the holidays. and a close up of some of the quilting! I am still working on my Pinwheel and Posies quilt but with no specific recipient it has been pushed to the end of the current project list. Here I was completing the pinwheels. I have since finished all the pinwheels and I'm framing them in the square within the square layout. Then I will be moving on to make the posie block. I have made a resolution to finish the projects I recently started before I start on a new one. I have 3 projects I want to start (three kits!) 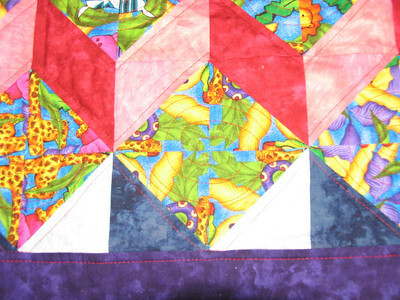 but I still have a rag quilt to complete and the pinwheel quilt. 0 comments on "Work in Progress..."